There has been a thread going on the WiFiSec mailing list at SecurityFocus the past couple days about Wi-Fi testing on a Mac. Amazon, and should be shipping in the middle of July (http://amzn.to/d4D2SU). In this fully-revised book we present step-by-step help for implementing multiple attacks against 802.11, Bluetooth, ZigBee and DECT, with countermeasures for each attack. he talks about the OS X “airport” utility. is the “Eye of Sauron”. there are no native tools, forcing us to rely on the NetMon package. Fortunately with OS X, we have the native airport utility. Simple, Secure Pairing) and RF fundamentals. 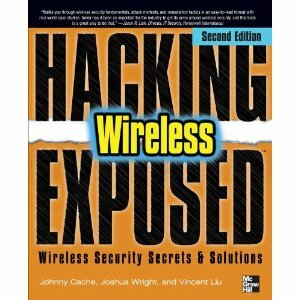 I can tell you from taking Josh’s Wireless Ethical Hacking, Penetration Testing, and Defenses course through the SANS Institute, that he *definitely* knows his stuff, and therefore, this book is a must read. I think this book is such a must read, that I am giving away a copy for FREE. Leave a comment with your best Wi-Fi Pentesting Tip. I’ll choose the best one a week from today (July 1st) and I’ll pre-order this book on your behalf.